Not one of us has the same sleeping style, so why should there be a one-size-fits-all mattress? At Brosa, we give you the opportunity to find the perfect mattress designed just for your needs. Choose from a firm sleeping base, a soft, cloud-like base, or something in between. Our double mattresses are the ideal option in guest rooms with double beds. Give your guests the royal treatment with a wondrously comfortable mattress for their stay. If you’re going to invest in the best quality, why not make it a premium product designed and made right here in Australia? 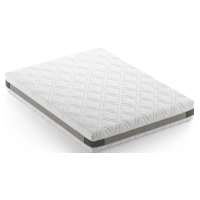 All our mattresses are Australian-made and constructed from the best adaptive foam materials to guarantee you a good night’s sleep every time. And if it doesn’t deliver? We’ll happily issue you a full refund and even pick up your mattress from your home! But we’re confident you’ll love your new mattress - and if you decide it’s a keeper, you’ll enjoy a 10-year warranty. Create the bed of your best dreams today by buying one of our luxurious double mattresses and enjoy fast Australia-wide delivery too.